Step inside an organ, and then step inside one of its pipes, and then settle in for a spell. Listen as the pipes resound. Listen not just to the pipe you’re in, but to how it responds to the pipes around it, to the air current, to the shape of the majestic hall in which it resides. Listen further to the song that seems to form, out of the ether, from the beading tonalities of this magnificent mix of space and sound. 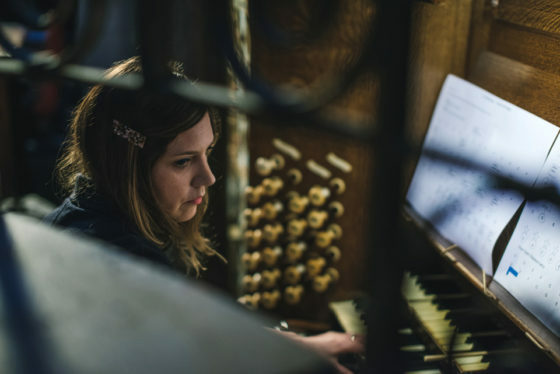 “Fairge,” which is apparently Scottish Gaelic for “the ocean,” was composed for, and recorded in June of this year on, an organ installed at Oude Kerk, not only the oldest church in Amsterdam, but the city’s oldest building as well, dating back 800 years. The organ itself is far more recent, built in 1965. Track originally posted at touchshop.org. More from Claire M Singer at clairemsinger.com. Image from spitfireaudio.com.